There was a huge attendance at the launch of Scotshouse Community Text Alert on Wednesday night, 20th March 2019. 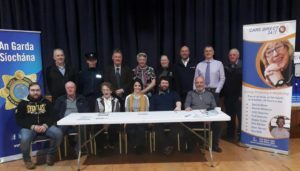 The meeting was attended by well over a hundred people, who were keen to sign up to the new county-wide service which is being backed by Monaghan County Council and An Garda Síochána in an innovative move which co-ordinates the 26 local text alert groups which are active in the county. The scheme also enables people living in parts of the county which are not covered by an active community alert group to also receive Garda alerts, effectively extending Community Alert to cover the entire county for the first time. Speakers at the meeting included Carol Lambe, Community Development Officer for Monaghan County Council, who oversaw the development of the Monaghan Community Alerts project. She explained that people with smartphones can access the service by downloading the Komeer app onto their phone, and searching for ‘Monaghan Community Alerts’, then entering their email address or joining up through their Facebook account. People who don’t have a smartphone can receive the service to their ordinary mobile phone as a text message. To sign up to receive the service as a text user, you must complete a Sign-Up form and return it to either the Council, your local community alert group or a Garda station. Sign up forms are available in all Garda stations and Council offices and libraries, and from local Community Alert committee members. Also speaking in Scotshouse was Garda Crime Prevention Officer, Sgt Mick Duffy, who had brought along the Property Marking Machine to demonstrate how it works. This is another project which has been overseen by Monaghan County Council, and which grew from the Joint Policing Committee, in response to an identified need to find ways to prevent crime, especially theft in rural communities. The machine stamps the item owner’s Eircode into the item. Warning stickers and signage then are used to draw the thief’s attention to the fact that the items are marked, to deter thieves from targeting the property in the area. It also makes it very simple to re-unite a person with their property if the Gardai recover stolen goods, as the Eircode immediately links that item back to where it came from. Sgt. Duffy demonstrated how quick and easy it is to mark items, and Chairman Eoin Condren confirmed that the Committee intends to book the property marking machine very shortly, taking another step towards making Scotshouse one of the safest places to live in County Monaghan. The property marking machine is available free of charge to communities, sports clubs and businesses who want to mark items they feel are at risk of theft. It can mark anything from mobile phones up to trailers. To book the machine, phone the Community section in Monaghan County Council on 047 30500 and ask for Fionnuala Mulligan or Carol Lambe.